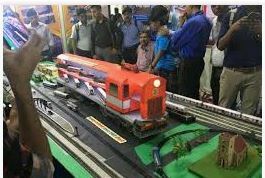 STORY: As an act of upholding the heritage of the railways of the past, Western Railway of India organised an exhibition in financial capital, Mumbai on Tuesday (February 12). Visitors and especially school children flocked to see the exhibition which had heritage stations, working models of railway engines and steam locomotives on display. We organised this exhibition because we wanted the youth to see what Railways was like in old times, said the Chief Public Relations Officer of western Indian railways, Ravinder Bhakar. A majority of Mumbai’s working population depends on suburban railways as the city faces long traffic jams, lacks parking spaces and has poor road conditions. Mumbai’s suburban railway system ferries eight million commuters daily and is considered as the lifeline of the city. The network is severely overcrowded during peak hours when the number of passengers exceeds the network’s carrying capacity by more than four times.